So! 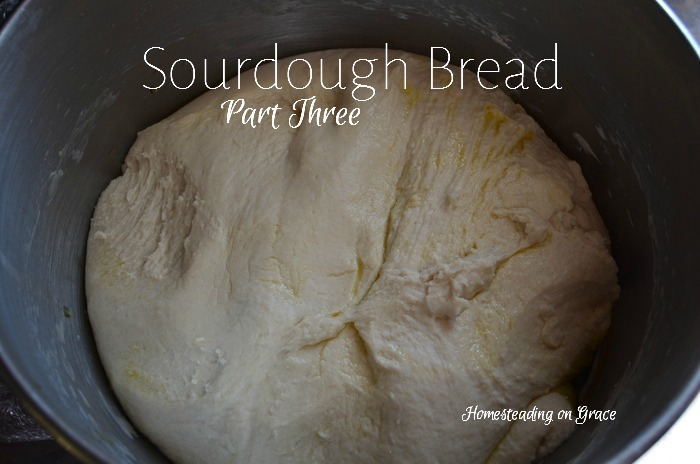 Today we are going to actually make some sourdough bread! Are you excited? When I get up in the morning, I'll go ahead and mix up the dough ball while I'm fixing breakfast, or cleaning and doing dishes, whatever is the most important. I leave the starter that I made last night in my Kitchen Aid bowl and just put it on the scale and zero it out. I measure in 20-21 ounces of bread flour and 12 ounces of filtered or spring water. And I put the barm in the refrigerator. Remember the barm is what you keep in the fridge, the starter is what you're using to make this bread. I put the bowl back in the Kitchen Aid and add the dough hook. I mix the starter, flour, and water with the dough hook for one minute on speed 1. (If you were doing this without a Kitchen Aid, you would have to mix it by hand or spoon in a bowl. And it would take longer, but still doable.) After the minute is up, the dough ball is pulled together and wet. I let it rest for 1 minute. So I turn on the timer for 1 minute while it's mixing when that beeps I turn off the mixer and set the timer for another minute. You with me? During the resting minute, I add 2 tablespoons of olive oil to the dough. I just drizzle it on top and let it drip down while the dough is resting. 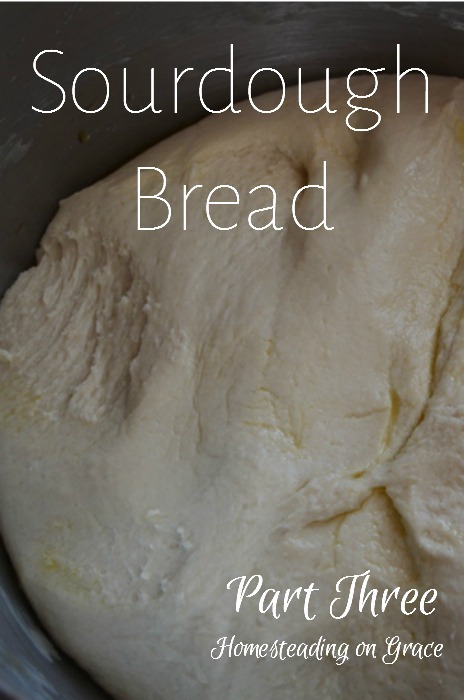 Without the Kitchen Aid, you would need to drizzle the olive oil in the bowl and kind of work it in before turning the dough out on the counter to knead. You can knead without a floured surface if you use olive oil. The olive oil helps make a nice soft crust. Typical sourdough bread is made of only flour, water, and salt, and it's delicious this way too, but it does have a harder crust. My family prefers the softer crust. Once the minute is up, I turn the Kitchen Aid on speed 2 and set the timer for 4 minutes. This is the kneading speed, and the Kitchen Aid gets it done. When the timer gets down to 2 more minutes, I add 2 teaspoons of salt to the bowl while it's running. Salt actually retards the sourdough, so if you add it sooner it will kill the sourdough it comes into contact with. The amount of salt is also changeable. In the winter, when it is already cold and my sourdough takes even longer to rise, I will give it less salt. During the hot summer, I give it the full 2 teaspoons so that I will get a slightly slower rise. After those 4 minutes are up, it should be ready! I've found during the winter that I need an additional resting period and kneading period, although usually only 2 more minutes of kneading. During the summer, it's ready. The easiest way to check is it stick a thermometer into the dough. It should read around 80 degrees. Less than 80 needs more kneading. 80 degrees means the sourdough is mixed in and the dough is warm enough for it to really begin feeding. So you'll have a faster rise. Now, drizzle a little more olive oil in the bowl around the sides so that your dough ball won't stick to the bowl, push the dough into the bowl and cover the bowl tightly with a suction lid . We'll let it rise for a couple of hours on the counter like this before we shape it. Which will have to be in another post, because this one is already super long! Now it's almost time for some sourdough bread! I hope you have some butter ready. Let me know if you have any questions. I love sourdough bread! I'm so impressed you make your own. You are inspiring, Jennifer :). Thanks Candace! But it's not that hard, just a little bit of work with a lot of waiting. You make it look fun to do. Good job on making your own bread. Fresh is always the best! It is fun! Thanks for reading!